There were perhaps twelve guards, Zeke counted to himself, were they after him? Or perhaps his new ’employer’, the red-haired woman, Leila Vistrani. Her fair skin shined against the afternoon sunlight, purple eyes as deep as gemstones stared down the guardsmen that surrounded the cantina. An array of polearms, blades, and bows were drawn and raised inching closer towards the pair. One of the guards became impatient and charged Leila, she spun past the charging blade, a short dagger found its mark in the underarm between the armor. A simultaneous slash by a longer blade at the heel and the guard dropped to the sandy ground. She was a truly skilled with a blade, that was for sure. Another guardsmen charged from her blind-spot, unfortunately she parried the attack and tripped the poor fool with a well-timed riposte. Zeke studied her intently until the sound footsteps on his left alerted him, the blade head from a glaive became parried. An upward cut slashed through the shaft, with a quick kick at the guard squarely in the chest. The guard fell onto his back, the weight of the armor most likely knocked the wind out of the man underneath. The rest of the armored men charged into the fray after their comrades sudden dispatch, the pair continued to parry and riposte against them. Their backs toward each other, but sooner or later their stamina would begin to wane. There were perhaps a five or six guards left, their chances looks prosperous, their momentum made it seem quite probable. A few beads of sweat dripped down Leila and Zeke’s brows, drops of crimson fell onto the brown sand from their blade tips. “Not to shabby, I can see why Elias sent you. You can hold your own pretty well,” Leila said in between deep breaths. “Same to you,” Zeke managed with a grin. Suddenly he felt a twitch underneath his eyepatch, it burned. The young man’s stance stiffened while his good eye began to frantically dart between the armored men and down the empty streets. Leila spotted the danger before Zeke, she lowered her blade and eased her stance but her intense glare did not falter. The distant sound of metal boots from a nearby alleyway clued the young man quickly as their visage came into view. Metal plate with large pauldrons, gold and blue robes that flowed against the hot desert air, a golden crest with a large bird. True inquisitors, the ones on the city streets were entrants or novices. These were seasoned veterans, mage-hunters by trade, warriors that forsook decency in favor of efficient killing. One was towering, nearly seven feet tall, covered in armor with a large greataxe, his face hidden by the large boxy helmet. The other was shorter than Leila, he did not wear a helmet but strode ahead of the brute. He looked younger than Zeke. Yellow hair as bright as the sun, skin as pale as white stone, but the most ominous feature were his crimson eyes. “Blood eyes” some people refer to them, superstitious folk fear them as their eyes invoke the latent bloodlust within their souls. The blonde inquisitor had longsword draped on his side, sheathed. Odd, Zeke thought. The other guardsmen gave the two a wide breath as if they too feared them. “You seem to have put quite the resistance Ms. Vistrani, along with the previous list of charges, I’m afraid you can no longer elude the law this time.” The blond young man sneered, his gaze was fixed on Leila. “I’ve done nothing wrong, Veras. Your brutes decided to take action with no warrant or provocation.” Leila scolded back. The one called Veras simply shrugged innocently like a child caught by their mother for something mischievous. “In either case, your obstruction to justice and my sources tell me that you have recently had become bequeathed with an illegal item of interest. Care to explain?” Veras returned Leila’s glare, a face full of malice and relentless hate. Zeke glanced at Leila who remained firm in her stance, she did not budge with the inquisitor’s query. He knew better than to question her now, given the intensity of the situation. Most of the guardsmen on the ground were not slain, merely incapacitated. Elias did not inform Zeke of any illegal items, granted neither did the job contract. “Enough of this,” Veras retrieves an ornate emblem from underneath his robes, divine light began to glow on the ornament as the inquisitor chanted words of power. Zeke recognized it as a spell to bring forth only truthful words, harmless to most but in circumstances it could be dreadful. Zeke felt a tug on his mind as the spell finished, his left eyepatch began to seathe and burn underneath, his mind battled against the spell’s influence. He looked over at Leila who seemed unphased, but it could all be a ruse. “Now Leila, where is the item?” Veras demanded. “I don’t have any illegal items in my possession,” she replied. The inquisitor scrutinized the crimson-haired woman, a hint of frustration in his eyes. “Where is the Eye of Ashara? !” His voice bellowed and roared against the sand, it shook the free standing glassware and plates nearby. “I don’t have it,” she continued. Veras’ eyes twitched, complete anger and rage befell his face. A shade of red rose up from the base of his neck up to his cheeks and forehead. “You lie!” He yelled, the sound of crackling thunder resounded in his fit of rage. The taller inquisitor placed a hand on Veras’ shoulder, which seemed to quell the young blood-eye. He took a few quite huffs before storming off into the dark alleyway they arrived from. The remaining guardsmen retrieved their injured comrades, when they were far beyond their view, Zeke sheathed his blade and turned to Leila. Her blade pointed at the young man. “What did you do? I felt the power of the inquistor’s magic and then suddenly it faded. Explain.” Her sharp eyes remained transfixed on the young man. With his left hand, he carefully extracted an amulet from underneath his leather armor, a golden disc with a dark red gem in the center. “Repeals against magics that utilize the art of discerning truths and clairvoyences, unfortunately, it has been spent for the day. Your friend will most likely figure out the truth sooner or later. We should best make ourselves scarce,” he calmly informed. A moment or two passed before Leila lowered her blade and her demeanor softened. She sheathed her blades and retrieved her fallen cloak from the benches. She silently walked down another dark alleyway, Zeke pulled the hood of his cloak over him once more and followed close behind. The left side of his face was sore and ached with pain still. Alright everyone, that’s it for this week on the Anthology from the Land of Magic – Subject Zero. I hope you enjoyed it and I want to thank you for your readership. If you want to remain updated with the blog please email subscribe, or follow us on Facebook and Twitter. 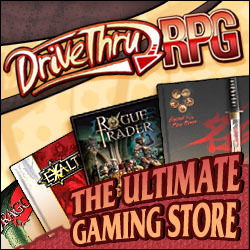 If you liked what we do and want to pitch in and help us with our future endeavors, we have a donate button and an Amazon store link for all your D&D product needs. Thanks again and we’ll see you next week!